This website is dedicated to the memory and work of one of the most prolific makers of songs in the folk idiom during the twentieth century. Certainly Graeme's lyrics are among the most sought after universally, by amateur and professional performers. Many who have heard his music may well not be familiar with the quiet, self effacing, publicity-shunning, kind, gentle man, a brilliant raconteur, who could hold an audience spellbound with his tales and stories, often true, but embellished in his own inimitable manner. 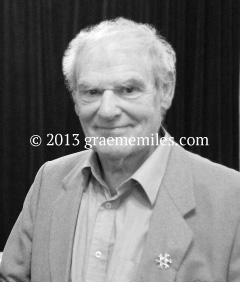 The website is a focal point for anything related to Graeme and his work and as it develops you will be able to purchase merchandise, contribute anecdotes, request song lyrics or tunes, find that elusive CD, song book, poem, story or rendering of a work by Graeme Miles, or check out the next event that celebrates his work. Welcome. Please note that all profits from this website are shared between Teesside Hospice and The Graeme Miles Bursary.